The central nervous system was previously thought to draw oxygen and nutrition from the arteries and discharge carbon dioxide and other metabolic wastes into the venous system. At present, the functional role of cerebrospinal fluid in brain metabolism is not fully known. In this prospective observational study, we performed gas analysis on venous blood and cerebrospinal fluid simultaneously acquired from 16 consecutive preoperative patients without any known neurological disorders. The carbon dioxide partial pressure (pCO2) (p < 0.0001) and lactic acid level (p < 0.001) in the cerebrospinal fluid were significantly higher than those in the peripheral venous blood, suggesting that a considerable proportion of metabolic carbon dioxide and lactic acid is discharged from the central nervous system into the cerebrospinal fluid. The oxygen partial pressure (pO2) was much higher in the cerebrospinal fluid than in the venous blood, corroborating the conventional theory of cerebrospinal fluid circulatory dynamics. The pCO2 of the cerebrospinal fluid showed a strong negative correlation with age (R = − 0.65, p = 0.0065), but the other studied variables did not show significant correlation with age. Carbon dioxide and lactic acid are discharged into the circulating cerebrospinal fluid, as well as into the venules. The level of carbon dioxide in the cerebrospinal fluid significantly decreased with age. The central nervous system (CNS) is commonly believed to draw oxygen and nutrition from the arterial system and discharge carbon dioxide (CO2) and metabolic wastes, such as lactic acid, into the venous system. However, in addition to this conventional metabolic pathway directly from artery to vein, cerebrospinal fluid (CSF) is derived from the arterial system and drained into the venous system, with a turnover rate of three to five times per day [1, 2]. The CSF is known to function as a shock absorber for the CNS, protecting it from external impact [3–5], but its physiological functions and its role in CNS metabolism are not fully known. Recently, researchers discovered a CNS drainage system passing through the CSF-filled para-vascular space and eventually leading to the dural lymphatic vascular system and cervical lymph nodes [6, 7]. This para-vascular CSF flux is thought to allow the exchange of water and solutes between the interstitial fluid (ISF) of the parenchyma and the CSF [8–10]. One subsequent experiment showed that this para-vascular CSF–ISF exchange is facilitated by arterial pulsation , while another revealed that it allows metabolic wastes in the brain and spine to be drained into the circulating CSF along with the pulsatile bulk flow . As a result, the circulating CSF probably contains unknown levels of metabolites discharged from the ISF of the brain parenchyma via the para-vascular space. However, to our knowledge, no human studies have compared dissolved substances, including metabolites such as CO2 and lactic acid, between simultaneously-obtained samples of CSF and venous blood. In the present study, we compared dissolved solutes, namely oxygen, CO2, electrolytes, and lactic acid, between simultaneously-acquired CSF and venous blood samples from preoperative subjects with no known neurological diseases. In so doing, we aimed to ascertain the solute gradient between the CSF and venous blood, and to achieve new insights into the role of CSF in the CNS drainage system. This study was performed in compliance with the Code of Ethics of the World Medical Association (Declaration of Helsinki; 1989). Blood and CSF samples were collected at the Tohoku University Hospital (Sendai, Japan). The study was approved by the Institutional Review Board of Tohoku University Hospital (IRB approval number: 2018-1-475). Written informed consent was obtained from all enrolled subjects. All enrolled subjects were preoperative patients awaiting lumbar anesthesia, and all were aged ≥ 18 years. The following exclusion criteria were applied: (1) pregnancy, (2) severe spinal canal stenosis, (3) diagnosed neurological disorders, including dementia, (4) brain or spinal cord lesions. Based on these criteria, we selected 16 consecutive patients in December 2018. They were awaiting the following types of procedure: knee joint surgery, skin biopsy, hemorrhoid surgery, etc. All procedures were unrelated to the brain and spinal cord. Venous blood and CSF samples were extracted from each patient in the operating room of Tohoku University Hospital during the lumbar anesthesia procedure. Venous blood was extracted from each arm, while CSF was extracted at the lumbar level. Patients were conscious and received no supplemental oxygen during sample collection. None of the patients had any history of respiratory disease with ventilatory impairment. Both venous blood and CSF were extracted using a 5-cm3 blood collection syringe designed for use in blood gas analysis. From each patient, 1 cm3 of venous blood and CSF were extracted. Because the samples were aspirated directly from the needle, neither was exposed to room air. Thus, it is unlikely that the room air or the time period between collection and sample measurement affected the data. The extracted venous blood and CSF were subjected to gas analysis within 10 min of sample collection. All analysis was performed using the same device (ABL800 FLEX blood gas analyzer; Radiometer, Brønshøj, Denmark) in the operating room of Tohoku University Hospital. The following variables were measured: pH, oxygen partial pressure (pO2), CO2 partial pressure (pCO2), standard base excess (SBE), bicarbonate (HCO3−), sodium ion (Na+), potassium ion (K+), chloride ion (Cl−), anion gap (AG), glucose level, lactic acid level, and total bilirubin level. Gas analysis data were compared between the venous blood and CSF of each subject using either the paired t test or the Wilcoxon signed-rank test, depending on whether the data were normally distributed. The lactic acid level of the venous blood was abnormal (4.3 mmol/L) in one subject; a test of outliers confirmed that this result was an outlier (p < 0.0001). Thus, the lactic acid data from this subject were not included in the present study because the measured level suggested that the patient had lactic acidosis that could have biased the data interpretation. Because multiple variables were compared simultaneously, p-value < 0.01 was regarded as statistically significant. Statistical analyses were conducted using either SPSS Statistics Base 22 software (IBM, Armonk, NY, USA) or MATLAB R2015a (MathWorks, Natick, MA, USA). The 16 enrolled subjects (10 men, six women) had a mean age of 59.5 years (range 25–87) and a mean body mass index (BMI) of 23.9 (range 16.5–38.9). Eight underwent lumbar anesthesia for hemorrhoid surgery, six for skin biopsy, and two for joint surgery. The gas analysis results of the venous blood and CSF samples are listed and compared in Table 1. The mean pO2 (p < 0.0001, paired t-test), pCO2 (p < 0.0001, paired t-test), and lactic acid level (p < 0.001, Wilcoxon signed-rank test) were significantly higher in the CSF samples than in the venous blood samples. To visually confirm that the dissolved levels of these solutes were actually higher in CSF than in venous blood in most enrolled subjects, the paired distributions of the pO2, pCO2, and lactic acid level were depicted (Fig. 1). The distributions of all three solutes were higher in the CSF than in the venous blood of most enrolled patients. The mean pH, K+ level, and AG were significantly lower in CSF than in venous blood (p < 0.0001 in all cases, paired t-test). Meanwhile, the mean Na+ level and HCO3− level did not differ between CSF and venous blood (p ≥ 0.10 in both cases, paired t-test). The mean Cl− level was significantly higher in CSF than in venous blood (p < 0.0001, paired t-test). The pCO2, pO2, and HCO3− levels in CSF were evaluated for correlation with age. Figure 2 shows that pCO2 in CSF showed a significant negative correlation with age (Pearson’s correlation coefficient [R] = − 0.650, p = 0.0065), while pO2 and HCO3− in CSF showed no significant correlation with age (R < 0.20, p ≥ 0.10 in both cases). None of the following factors showed any significant correlation with age: pCO2 in venous blood, lactic acid in venous blood, and lactic acid in CSF (p ≥ 0.10 in all cases). 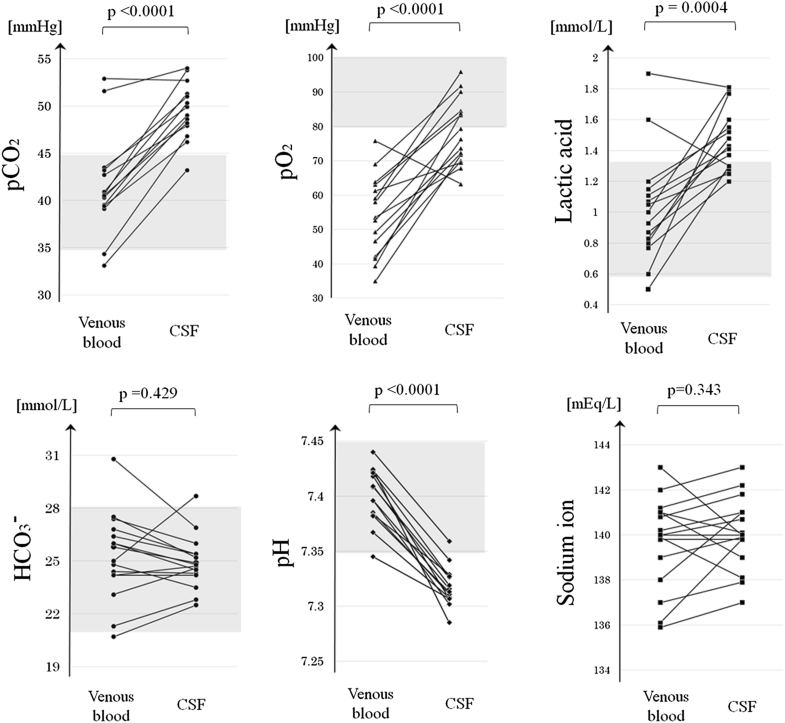 In the present report, the levels of pCO2 and lactic acid were higher in CSF than in venous blood, suggesting that the CNS discharges CO2 and lactic acid into the CSF. Furthermore, the levels of pCO2 in the CSF significantly decreased by age, even though those in the venous blood did not change, suggesting that the efficiency of CO2 discharge from the brain parenchyma into the CSF decreases with age. However, this was an observational study, so the exact mechanism of CO2 and lactate discharge into CSF remains unclear. Nonetheless, our findings may offer new insight into the role of CSF in the drainage system of the CNS. The movement of lactic acid across the cell membrane is mainly mediated by proton-linked mono-carboxylate transporters (MCTs) [13–15], which are widely distributed throughout the body of all living organisms, even on circulating blood cells and brain astrocytes [16, 17]. In total, 14 types of MCTs (MCT 1–14) have been identified, with each type showing specific tissue distribution across the body [18, 19]. Within the CNS, MCT 1, MCT 2, and MCT 4 are known to be expressed by ependymal cells and astrocytes [20, 21], and several types of MCTs are also suggested to be expressed by the endothelial cells of micro-vessels and choroid plexus epithelial cells [22, 23]. The ependymal cell layer does not contain tight junctions and solutes are thought to freely diffuse through the intercellular gaps, suggesting that MCTs are not necessarily required for the ISF-CSF exchange. Meanwhile, because the microvascular endothelial cells usually form tight junctions, exchange of lactate between blood and CSF requires MCTs. Because most MCTs function as gradient-dependent transporters regulated by the gradient of lactate and protons across the membrane [24, 25], the observed gradient of lactate level between the venous blood and the CSF in this study would be rationally explained by the discharge from ISF into CSF, rather than the transport via the choroid plexus. Several studies have suggested that MCTs are predominantly expressed by ependymal cells on the basolateral side, while others have observed MCTs on the apical side, facing the CSF [26, 27]. Thus, in addition to the drainage system via para-vascular CSF flux, ependymal cells may also play a role in the discharge of lactic acid from the brain parenchymal ISF into the CSF. The CO2 in the brain parenchyma probably discharges into the circulating CSF via gradient-based diffusion. Previously, it was assumed that dissolved gases were allowed to diffuse across cell membranes almost without restriction . Later studies showed that the movement of CO2 across the cell membrane is somewhat restricted, because the unstirred layer in the membrane vicinity functions as diffusional barrier [29, 30]. More recently, the degree of cholesterol content in the phospholipid membrane was shown to be the primary regulator of membrane permeability to CO2 . Although the permeability of CO2 would be surely restricted to some extent by the glial cells that delineate the ISF from the CSF, ependymal cells and perivascular astrocytic endfeet form a looser barrier than microvascular endothelial cells that form tight junctions. Because there are gaps of varying tightness in the ependymal cell lining and astrocytic endfeet, CO2 would be able to easily diffuse from the brain parenchymal ISF into the CSF [5, 32]. Consequently, the ISF of the brain parenchyma, in which the metabolites from neurons are dissolved, can be regarded as being directly connected with the CSF as a continuum. Considered together with the findings of the present study, it follows that CO2 from the CNS drains into the CSF, possibly via para-vascular CSF flux or ependymal gap junctions, as well as into the venules via capillaries. Therefore, because the CSF turns over three to five times per day [1, 2], it is likely that the circulating CSF makes a significant contribution to the removal of CO2 and lactic acid from the CNS. Another notable finding of this study was that the pCO2 in the CSF significantly decreased with age, whereas that in the venous blood did not, suggesting that CO2 discharge from the CNS into the CSF gradually decreases with age, or that the turnover rate of circulating CSF increases with age. However, the CSF turnover rate is known to significantly decrease with age , so the age-dependent decrease in CSF pCO2 cannot be explained in these terms. Therefore, it is likely that either CO2 production within the brain parenchyma or the efficiency of CO2 discharge into the CSF decreases with age. Future research is warranted to evaluate the efficiency of CO2 discharge into the CSF in patients with neurological diseases of unknown cause. Finally, we shall consider whether the absence of blood cells in the CSF may have affected the measured data and derived conclusions. The gas analyzer used (ABL800 FLEX) measures pH and pCO2 using potentiometry, which is based on the Nernst equation; pO2 and lactic acid were measured using amperometry. One previous study validated and recommended the use of gas analysis to measure pH in pleural effusion samples , so gas analyzers can reliably measure pH and dissolved partial pressures, regardless of whether the sample contains blood cells. In further support of this conclusion, Na+ concentrations measured using potentiometry did not differ significantly between venous blood and CSF, nor did HCO3− levels calculated on the basis of pCO2 and pH using the Henderson–Hasselbalch equation (p ≥ 0.10 in both cases, paired t-test). The principle limitation of the present study was the small sample size. In addition, the study only reported an observation of physiological phenomena, the exact molecular mechanism of which was not elucidated. The clinical significance of the age-dependent decrease in CSF pCO2 also remains unclear. To further characterize the association between CO2 discharge into the CSF and various neurological disorders, future researchers should compare controls with patients who have such disorders. Another limitation is that gas analysis of arterial blood was not performed in the present study, so it is not clear whether the enrolled subjects had normal blood gas levels in their arterial blood. Finally, peripheral venous blood was extracted from the arms in the present study, rather than from the venous sinuses around the arachnoid granulations. We did not confirm experimentally that the levels of solutes and dissolved gases in venous blood from the arms were comparable to those in the venous sinuses. To determine the concentration gradient between CSF and venous blood, samples must be acquired from adjacent sites. The present results demonstrated that CO2 and lactic acid are discharged from the human CNS into the circulating CSF. The pCO2 of the CNS may decrease with age, even though that in venous blood does not. The clinical significance of such a CO2-drainage system in the CNS has not yet been elucidated and should be addressed in future research. TA, MA, KI, and TI conceived the study. TA, EO, HT, MK, RK, and MY designed the specific process of this study. TA, EO, HT, MK, RK, and MY obtained and processed the blood and CSF samples. EO and MY selected the patients. TA, MA, and KI were involved in the statistical analyses and the interpretation. IN and MA verified the study design and interpretation from a professional viewpoint. IN, MA, MY, and TI supervised the study. All authors contributed to editing of the manuscript. All authors read and approved the final manuscript. We thank all participants and their families for taking part in this study, as well as the doctors of the Department of Anesthesiology, Tohoku University Hospital for collecting the samples and Dr. Kazuhiro Sakamoto (Department of Physiology, Tohoku University) for offering professional comments and making critical revisions to the manuscript. The original data of this study are available from the corresponding author upon reasonable request. This research did not receive any grants from funding agencies in the public, commercial, or non-profit sectors.